After his Microsound Textures compendium, Richard Devine revisits Chromaphone in its second incarnation and presents an unsettling and opaque collection of new sounds. The 111 Epicycles presets adventurously delve into enigmatic and uncertain lands. Nine categories structure the series of patterns and textures: Soundscapes, Basses, Plucked Strings, Keys, Synths, Strings and Pads, Percussions, Arps, and Effects. Richard Devine is a versatile and prolific artist and sound designer based in Atlanta, Georgia. He has released five different albums and performed his music worldwide. He has provided sounds to major companies such as Apple, Audi, BMW, Coke, Nestlé, Nike, and many more. He has also done some scoring for TV and movies, and sound design for video games. 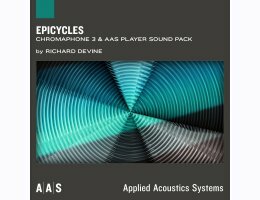 Richard also has done synthesis programming for major audio companies and recently released his own sound effect libraries with Sony Creative Software.